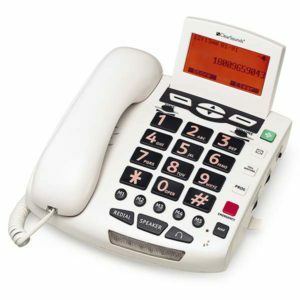 Amplified Phones come with amplification and tone control, which allows you to turn the volume up much higher than you can on a traditional phone, as well as adjust the frequency of the other caller’s voice to better fit your hearing. Some phones allow you to pair a Bluetooth® cellphone and will amplify both cell and landline calls . Other phones come with captioning capabilities (funded by the FCC) which will caption your conversation on a large built-in screen, as well as amplify it . All of the phones in this section are hearing aid compatible, so you shouldn’t experience any feedback or interference that can be caused by hearing aids. The most important step in choosing an amplified phone is determining how much amplification you need, and this will depend on the degree of your hearing loss. To help guide you through this process, we’ve developed a color scale that shows you the amplification level of each phone, and whether that phone is recommended for your hearing loss. Click Here to view all of the Telephones Available.